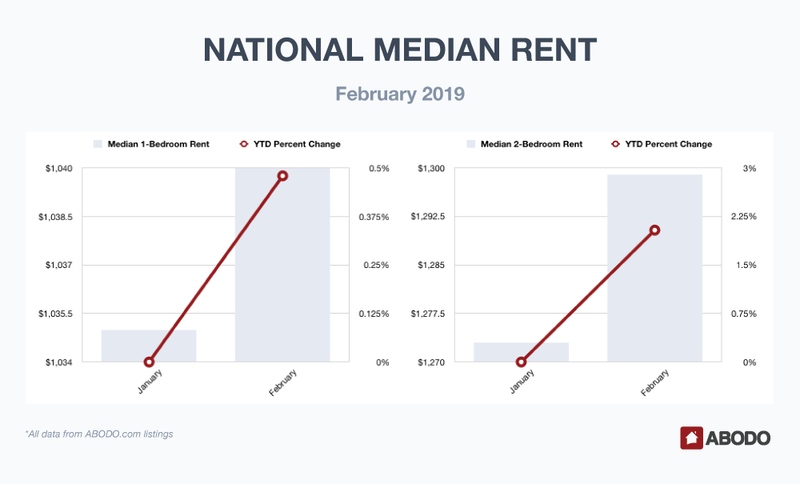 [National Report] February 2019 Rent Prices: Can We Identify an Early Trend? As we wrapped up 2018, we concluded that we had seen a less than exciting year with basically flat rent prices. 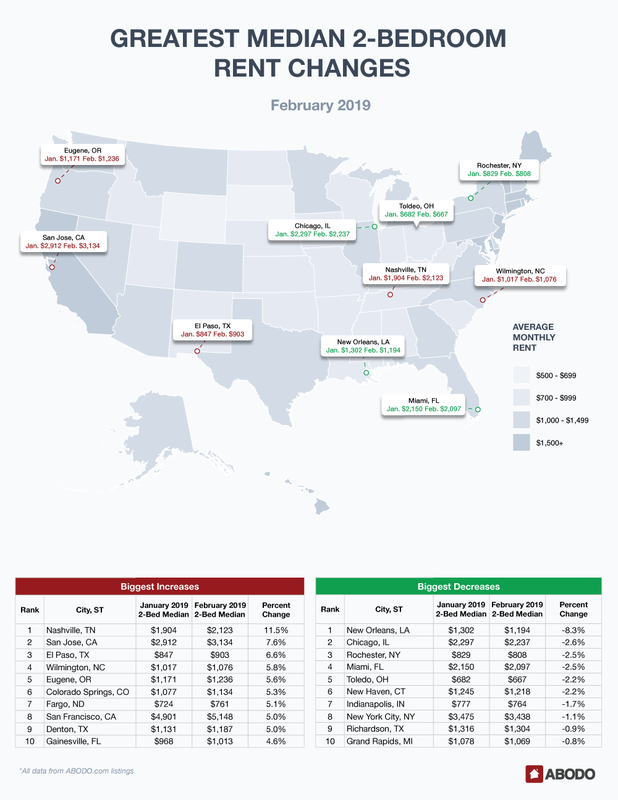 We’ve received fresh February 2019 rent stats, so let’s look at what’s happening now. In February, both median one-bedroom and two-bedroom units posted increases. One-bedrooms rose from January’s $1,035 median to $1,040 in February, a .48 percent change. Two-bedrooms were more active with a 2.04 percent gain from $1,273 to a February mark of $1,299. February showed some healthy gains as Columbus, OH moved 11.9 percent to a still affordable $1093. Savannah, GA was not far behind with a similar 10.8 percent increase to $1,079. 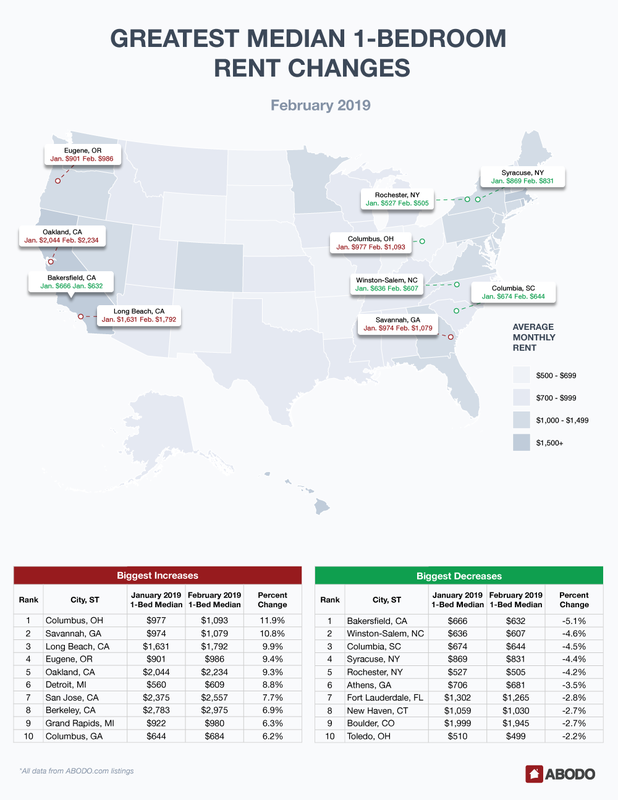 Long Beach, CA, Eugene, OR and Oakland, CA reported rises of 9.9, 9.4, and 8.8 percent respectively, and pricey San Jose, CA took the seventh spot with a stout 7.7 percent increase. Baby boomer paradise Berkeley, CA, frigid grand Rapids, MI and very inexpensive Columbus, GA rounded out the top ten one-bedroom gainers with increases between 6.2 and 6.9 percent. The one-bedroom top ten losers showed a much narrower range as Bakersfield, CA, the home of Buck Owens, reported a loss of 5.1 percent to $632. A one-bedroom can be rented in Winston-Salem, NC for only $607, down 4.6 percent from January’s $636, and Columbia, SC, Syracuse, NY, and Rochester, NY fell between 4.2 and 4.5 percent. The bottom five decreasers were closely bunched, losing 2.2 percent to 3.5 percent. In that category, Athens, GA was number six, followed by Fort Lauderdale, FL, New Haven, CT, and Boulder, CO.
Toledo OH won the prize for the lowest rent on the one-bedroom losers list as that city posted a 2.2 percent loss that took it under $500 to $499. Nashville, TN bucked the moderate trend with an eye-opening 11.5 percent rise to a slightly pricey $2,123. Expensive San Jose, CA rose another 7.6 percent from $2912 in January to $3,134 in February. Nicely priced El Paso ($903) still rose 6.6 percent, and that rounded out the top three gainers. Wilmington, NC, Eugene, OR, Colorado Springs, CO, cold Fargo, ND, and super high-priced San Francisco, CA ($5,148!) reported February rent increases between 5 and 5.8 percent. Balmy Gainesville, FL held the number 10 spot with a median rent increase of 4.6 percent to $1,013. It looks like the NFC Championship game’s bad luck affected the Big Easy’s apartment market as New Orleans, LA led the loser list with a significant two-bedroom median apartment decline of 8.3 percent, down to $1,194 from January’s $1,302. The next five decliners make NOLA’s loss look even steeper as Chicago, IL, pleasant Miami, FL, cheap Toledo, OH ($667), and rarely seen on our charts New Haven, CT, all reported similar decreases from 2.2 to 2.6 percent. Gateway to the Midwest, Indianapolis, IN decreased by 1.7 percent to $764, and perennially expensive New York, NY fell by just 1.1 percent to $3,438. Providing more evidence that February decreases were generally mild was Richardson, TX, making the top ten list but only falling by .9 percent to $1,304. Grand Rapids MI took the number 10 loser spot, but that city only fell .8 percent to $1,069. FYI, the most expensive state average rent prices for both one- and two-bedroom units were both claimed by Massachusetts, at $2,525 for a one-bedroom unit, and $2,960 for a two-bedroom apartment. We still believe that both one- and two-bedroom units will post only modest increases in 2019. Since the stock market has recently recovered somewhat, and mortgage interest rates look steady as they hold around the five percent mark, we feel that if the government can avoid another shutdown and oil prices continue to stabilize, these factors will keep the economy chugging along and therefore produce rent price stability. In our chaotic political times, however, we know that a ramped-up trade war, an oil price spike or increased geopolitical tensions can all contribute to a recession that many pundits are calling inevitable. We know that economic slowing will arrive one day, but we think it may wait until 2020. Therefore, we again cautiously predict very moderate apartment rent increases for at least the first half of 2019. Be sure to read our March report next month.